On September 13, Southeast Asian states officially launched an upgraded database that would allow police forces in the region to exchange intelligence information. The database, which has been in the works for a while, marks the latest sign of cooperation among regional states in response to the terror threat posed by the Islamic State. While there continues to be a flood of commentary about the ‘relevance’ of ASEAN amid the organization’s 50th anniversary, awareness about what the organization and its multitude of bodies actually do remains quite poor, particularly among outside observers. 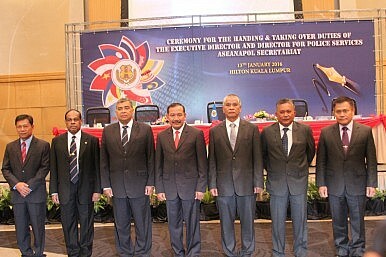 One of these institutions that has been in the spotlight of late has been ASEANAPOL (ASEAN National Police), an institution first convened back in 1981 for the chiefs of ASEAN police forces and other international law enforcement agencies to discuss law enforcement and transnational security issues. Just like many other examples of ASEAN regional cooperation, progress has been slow and far from easy. ASEANAPOL members were originally Malaysia, Singapore, Thailand, Indonesia, and the Philippines, and it took years before others like Brunei, as well as newer ASEAN members like Vietnam, Cambodia, and Laos, joined the body. And it was only in 2010 that the ASEANAPOL Permanent Secretariat based in Kuala Lumpur even became operational, which gave the secretariat a home rather than being just rotated around. One of the issues that has been in discussion within ASEANAPOL is speeding up the distribution of information, intelligence and assistance to countries in times of crisis. As I noted in a piece last year, after around ten years of discussion, the delegates at the 36th ASEANAPOL Conference in Kuala Lumpur had finally signed the ASEAN Communication and Coordination Protocol for Crisis Management (ACCPCM), which would be a boost in this regard (See: “ASEAN Police Chiefs Ink New Pact Amid Islamic State Fears”). There is no doubt that growing fears about the Islamic State and its presence in Southeast Asia – made clear by the Marawi crisis in the Philippines earlier this year – has served as a catalyst for regional cooperation (See: “What Did the New Asia Terrorism Meeting in Indonesia Achieve?”). We have seen some examples of that within ASEANAPOL, whether it be through collaboration on forensic science or greater cooperation with other bodies like Interpol and EUROPOL. Mechanisms like ACCPCM in particular would be important in terms of countries reacting to large-scale terrorist attacks, whether it be in terms of sharing information with regional counterparts or providing technical aid including force blast experts or investigative personnel. This week, as Singapore convened the 37th ASEANAPOL conference from September 12 to 14, we saw signs of further progress. Of particular note was the official launching of a new enhanced ASEANAPOL Database System or e-ADS 2.0 at the conference, which is meant to facilitate better connectivity and information exchange among ASEAN law enforcement agencies. This year’s ASEANAPOL Conference, which saw attendance by the 10 ASEAN countries and 18 other dialogue partners and observers, comes at a time when officials are concerned not only about the terror threat, but other security challenges as well from cybersecurity to drug trafficking. In his address to the conference, Singapore’s Deputy Prime Minister and Coordinating Minister for National Security Teo Chee Hean spoke about all three challenges and noted Singapore’s contributions – such as the new ASEAN Cyber Capacity Program – as it is set to assume the ASEAN chairmanship for 2018 soon from the Philippines which holds it this year (See: “ASEAN Cyber Challenge Exposed in New Interpol Probe”). On the cyber front, Singapore will hold the next iteration of its Singapore International Cyber Week later this month. The inaugural SICW was held last October (See: “Singapore Unveils New ASEAN Cyber Initiative”).